Wait? I know, I know. That blog post title may have been a little shocking… Death Race? Vegetarians? That’s a lot for one little title. We’ll tackle the Death Race and THEN the vegetarian part. Don’t worry, it ends with a delicious recipe! The Peak/Spartan Death Race is not for the faint hearted… even for those of you that claim to be pretty tough endurance athletes. It’s not just about running or biking… it’s about messing with your head for an extended period of time – a time that’s not defined at the start. Kept under tight wraps, no one outside the race designers know what is in store in this Summer’s June version of the event, but you can guess it will be pretty tough. Check out this post from Johnny Waite, the vegetarian who inspired today’s post about his experience at Death Race Camp to get a taste for what the racers will endure this Summer. Stay tuned for more on the Death Race and the people participating that are inspiring all kinds of delicious healthy food! I myself have dabbled in many different types of eating lifestyles: organic vegan, gluten-free, paleo, raw, and vegetarian. My niche and the lifestyle that works best for me is Clean Eating, but I have seen benefits from a variety of eating habits for a lot of people in my life. As a cook, I create recipes for dietary restrictions and lifestyles all the time. One of my favorites is vegetarian. One perceived as “tree huggers” vegetarians are emerging as a vast and differentiated consumer market and some notable vegetarian athletes may surprise you. Joe Namath, famous NY Jets quarterback and arguably one of the greatest athletes to come out of the NFL is a vegetarian. Martina Navratilova the tennis phenom was a vegetarian for most of her career and it earned her 18 Grand Slam singles titles and 31 doubles titles. 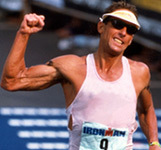 Dave Scott, nicknamed simply “The Man” holds the record for most Ironman World Championship victories (tied with Mark Allen) winning all six of them as a strict vegetarian. He came out of retirement at age 40 just prove he could and he took second. Carl Lewis, the track star went strictly VEGAN before the 1991 Worlds and said he ran the best meet of his life. Not too shabby for the vegetarian community. Most recently, I met an aspiring Death Racer training for the upcoming Spartan/Peak Race in June in Vermont: Johnny Waite. He’s a vegetarian and Crossfit enthusiast and his training this last week in Vermont gave him perspective, a touch of confidence, and an overwhelming sense that he can’t possibly know what is in store for his first Death Race. I told him I would pull something together that was vegetarian and protein packed for his training and I’ll be keeping in touch with him as he trains for the event in Pittsfield June 24th. Here is his very own vegetarian and clean death race dinner recipe! 1. Heat the oil in a medium saucepan over medium heat. Stir in the onions and garlic, and sauté until lightly browned. 3. Stir frozen corn into the saucepan, add lime juice and pureed cauliflower and continue to simmer about 5 minutes until heated through. Mix in the black beans and cilantro.